← What Ever Happened to Previews of Coming Attractions in Health? If you like this blog, send it to some of your friend. Let’s keep the conversation going. Second World War, we can never give up, because giving up means not winning. Maybe it’s also meant to remind us that, like all wars, this one is expensive, so we’ve got to give to keep it going. Of course the easiest way to support the cause, as we’ve been repeatedly told, is to buy something with a pink ribbon on it. Or, almost as good, carry something pink to show how much you care about women’s lives. 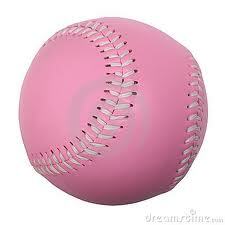 pink baseballs, maybe because that would be too emasculating. 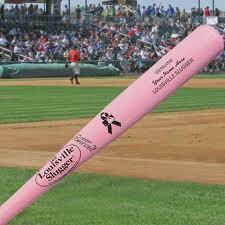 But pink bats and batting gloves — “real” men use them. While Major League Baseball — of which I am a fan — has had its challenges with public perceptions (like the steroid use issue, for example), it looks like a goody two-shoes compared to the National Football League. Several years ago, in an effort to distract people from the criminal activity of many of its players — often involving violence against women — the NFL got into the pink game with pink cleats, head bands, and players’ gloves. The NFL effort was encouraged and enabled by none other than Nancy Brinker, founder and leader of the Susan G. Komen for the Cure Foundation. A little like the Midas of breast cancer, everything Brinker touches seems to turn pink. It seems that Ms. Brinker is determined to hold on at the Komen Foundation until she either drives it into the ground or dies trying. In the latest departure from the executive ranks at Komen, Leslie Aun, long-time VP of Marketing and Communications has left the organization. While she declined to give a public reason for her departure, I have some evidence that she left because Brinker wouldn’t. 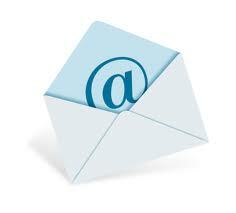 I know how the Komen email addresses are set up, so I periodically send messages to members of the leadership. Not surprisingly, I have never received responses to these missives. Nevertheless, ever persistent, I sent an email to Leslie Aun on a recent Saturday. My motivation in doing so was to respond to a quote from her in a review of the film Pink Ribbons, Inc., saying she hadn’t seen the movie. I wrote to suggest that she see it, if for no other reason than that she would want to see Brinker’s performance in it. I closed the message with my view that Brinker should resign. After I sent that email, I read in the New York Times that Aun had submitted her resignation. Imagine my surprise to get an email response from her indicating that she had been trying unsuccessfully to get Brinker to resign. I don’t want anyone to think that because pink marketing has gotten beyond ridiculous or Komen has lost its way, they shouldn’t support the breast cancer cause. While it’s true that more women die of lung cancer and heart disease, they don’t die at the young ages that so many women with breast cancer do. And the problem is so far from solved that we have to keep working until we can say with confidence that the next generation of women is not facing the scourge that ours is. 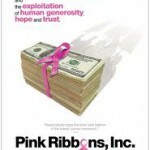 On the evening of May 31, Breast Cancer Action is hosting a fundraising sneak preview of Pink Ribbons, Inc. Information and tickets are available here. And wherever you live, don’t miss the film when it opens soon, hopefully in a theater near you. By the way, if you want to send messages to anyone at Komen, the way their email addresses work is first initial no space last name @komen.org. So for example, the email address for Liz Tompson, Komen’s President, is eThompson@komen.org. 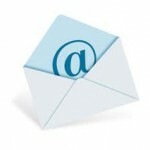 If you send a message and get a response, be sure post it here. This entry was posted in Breast Cancer and tagged armamentarium, Breast Cancer Action, Inc, Komen, Leslie Ann, major league baseball, Nancy Brinker, NFL, pink ribbons, war on canncer. Bookmark the permalink. I spoke at the screening of PRI in Huntington, NY for BCA. Today, on my own blog, I embedded the trailer or the movie with a link to the screening invite on the BCA page. One of my twitter friends is attending. She purchased her ticket today. I’d like to claim credit for that (but I won’t!). Tomorrow…… I expect to post a piece from a young woman from Italy who lives in the UK. She approached me with an Italian Komen ad. They have four races in Italy this year. The first one, I believe, is this weekend. The video will be embedded in tomorrow’s blog. Her piece for an online magazine, which she graciously translated for me will be included. I will be sure to link back to this post, too. She hates pink. She has little support on the other side of the Atlantic. Told her I’d gladly tag team with her! I was called out on my own blog for not towing the line and just accepting pink as good. That nasty little comment elicited a response from a male breast cancer patient who jumped in my defense. Was humbling to have a guy step forward…. Stay well….. will be sure to pass the info on the Komen email addresses to everyone I know! Thanks so much, Anne Marie! The BC language is bellicose! I felt it very strongly when I was being treated. It felt like I was allowing violence to my being, and I didn’t like it. Also alot of the language treats cancer like an invader, instead of something our bodies have grown, something that has to be healed, not killed. 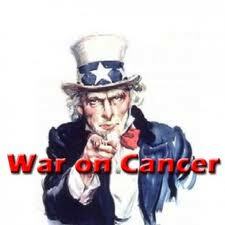 Do you think it’s any wonder that all that Breast Cancer research money is in the DOD? Thank you for this, Barbara. In large part, because of Ann Marie and others in the blogging community, I am learning how to navigate my way through breast cancer and its strange new lexicon, its politics. 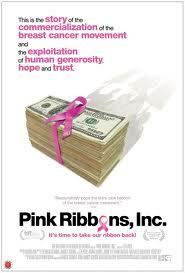 I’m ashamed to say that prior to my own diagnosis, I regarded the pink ribbon with a mixture of indifference and denial. For me, breast cancer was the thing that happened to other people, to celebrities who grace the pages of magazines, to women who don’t show up for their mammograms. What a fool I’ve been! Duped and manipulated by its mythology. It is jarring to associate with disease and death all the trappings of breast cancer awareness that have so innocently distracted me – ribbons and teddy bears and perfume bottles and cupcake liners. Such trinkets would not be out of place in a 19th century nursery rhyme about little girls, very far removed from the ravages of a disease that kills.